Depression - Life's Never Boring Beibi! In the last week of May 2018, the world shocked. Kate Spade ended her life by suicide. Not too long, Anthony Bourdain did it too. I was shocked and lost by Bourdain's death. If you happened read my review in his book here, you know how I inspired by his writing and bravado. That's why I cried instantly after hearing the sad news & expressed it in my IG stories. I asked people for asking help if they suffered. Surprisingly, there's a friend who respond it in contra-view. She argued how it impossible for the one who suffered for asking help. 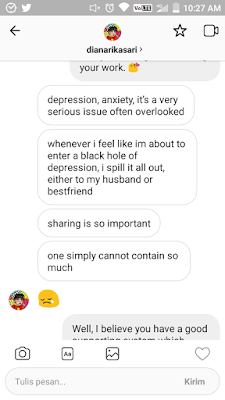 Because she had post-partum depression and when she try to communicate the symptoms, the rifles of depressing thoughts she had the respond will be like : "Don't act it such a drama." "Everyone has the same problem, don't overreact." The discussion between us became deeper. The biggest hunch of her depression came from the decreasing time for herself after having child. I could relate this so much because I felt the same way after had Hayu. But I'm not really upset or anxious about it too long because I had the antidote. As you know in my previous post when I met Diana Rikasari, I asked how she could juggling between works, business, motherhood, home. Interestingly, one point is she only working outside the home 2 days in a week. She maximized those 2 days with all the meetings, interviews, and another things needed to do outside home. She told me how in a day she could do until 9 meetings. It's a huge number and it shows how effective she managed her time outside home at once. I mean, we could see how her shoes brand UP grows, and now with Schmiley Mo and writing books too. It's possible. Then, I DM-ed Diana to say that I really hope she'll write a book with Motherhood theme, or how she does her business because I believe the book will help women especially for mother (like me) to be more productive and sharing her tips on time management etc. 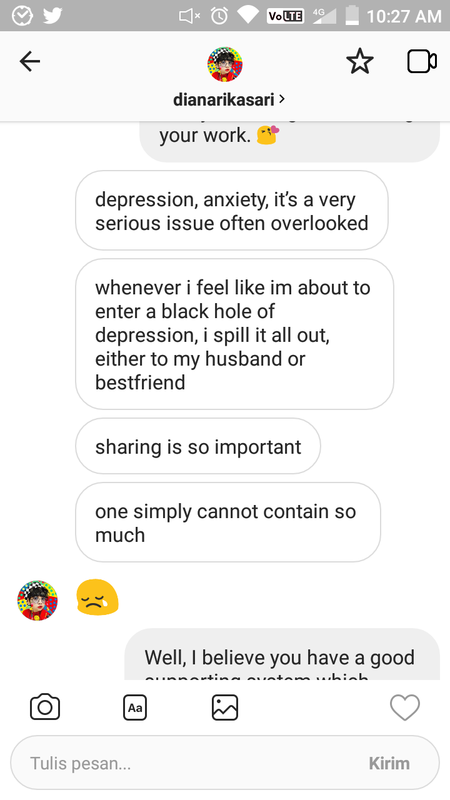 The conversation went along, she shared how she could handle the stress. The next day I read her post about it, it is really touche and well articulated. These rifle of incidents made me realize how important mental health to be discussed further and how shallow my knowledge on it. I want to learn self-love more and more. I want to connect better to myself, so I could do the same to other. To God. To my family. To you.